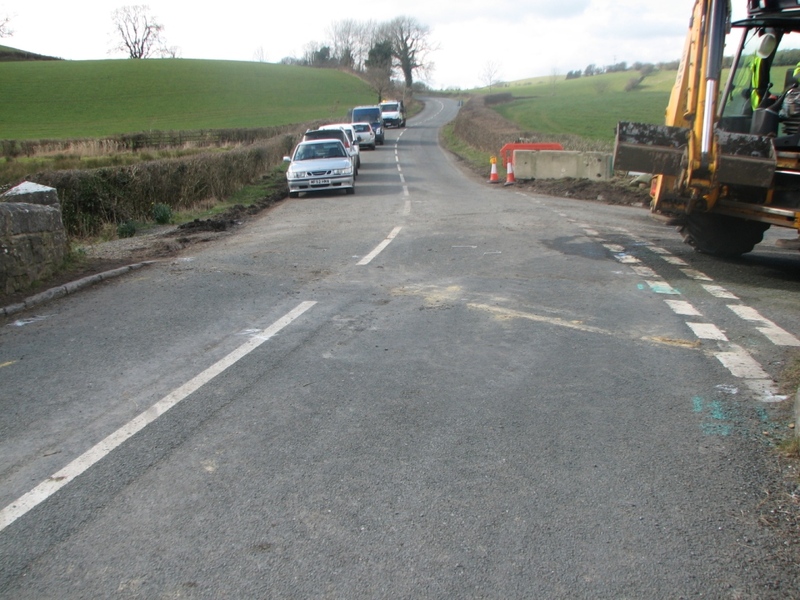 Gatebeck Lane (from Hutton Gate on the B6254 to Gatebeck) is NOT being gritted as it is not a priority route and is not the official diversion from Old Hutton to Kendal. Take extra care when using this road. The bridge reopened today at around 2pm, after being closed for 14 weeks. 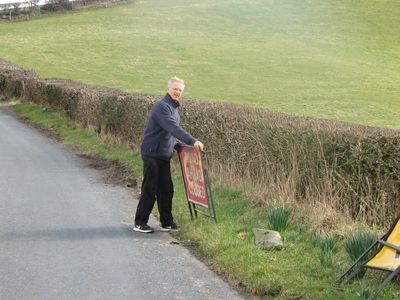 Here are views of the bridge sans barriers, the first car driving over, and the Parish Clerk helping to tidy up the signage on the approach to the bridge. Men are working on the bridge this morning. They said that after they have pumped concrete into the cavity it will take a few days to cure sufficiently for traffic to go over the bridge. The specified grout bags have been ordered to match the design and these are expected to arrive on Thursday. There is about 2-3 days work to complete the bagwork and a further 1-2days to allow for curing. That puts the likely opening as mid next week. Clearly the team will look to achieve this sooner if possible. I think this means he is now saying that the bridge will open by about 17th March. “Although we had originally hoped to have the bridge reopened by now, that has obviously not been possible. The initial bag work which was completed last week, enabled the props to be inserted to prevent further collapse. The remaining void now needs to be filled and the props removed. The void will be filled with specifically designed grout bags that will be filled under a controlled pressure, and following a curing period and the required strength obtained, the bridge will be reopened. The lead in time for these bags now means that it is now expected that we can reopen the bridge during week commencing 7th March, most likely towards the end of that week. Divers are working on the bridge today installing jacks under the foundations. The jacks will be adjusted to bear a certain load and then will be re-adjusted to take eventually 50 tonnes. This will take several days after which concrete will be put in and then left to cure. The divers say that the whole operation will not take many man-hours but will take up to a week because the bridge has to have time to adjust to the jacks. At least we know something positive is happening so the end is dimly in sight. 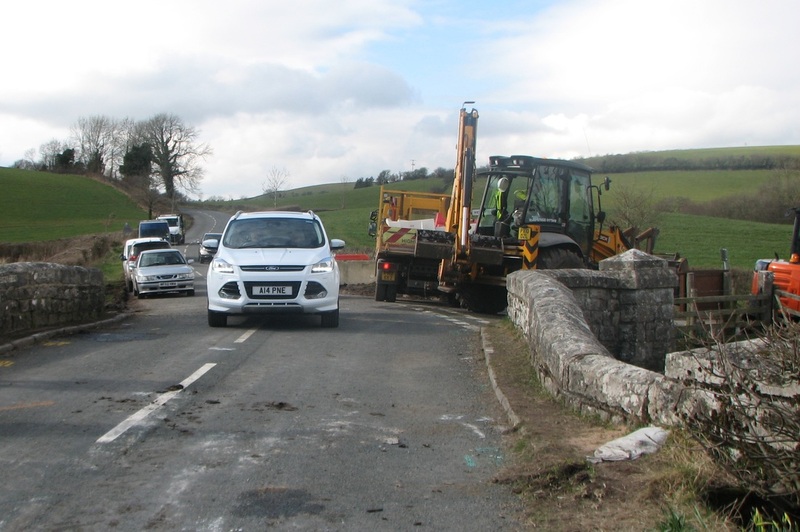 Follow this link to see CCC's "South Area Flood Recovery Update Briefing Note" dated 8th February regarding the status of bridges in South Cumbria, including St Sunday's Bridge. Tuesday 9th February - The end is in sight! As I write (10.45am), divers are doing (what they hope will be) a final survey of St Sunday's Bridge. I have been talking to them, and they say it has been undermined worst on the upstream Middleshaw side by over a metre and was supported with acrows in December. Nick Raymond and the divers have said that work will start this week and will take two days. Several days will then be needed for the concrete to cure. Today, the divers will also make a final (?) inspection of Beckside Bridge and it will be repaired when work has finished on St.Sunday's Bridge. Victoria Bridge in Kendal has been repaired and will be load-tested today to see whether it is OK to open it. I will keep you informed of further progress! I have been told that CCC plans to repair St.Sunday's Bridge in the next two weeks. Progress will depend on the river's flow being low. The parish council had hoped that the bridge problem would have been resolved by now. Councillors and myself have been stressing the urgency to politicians and CCC officers. I have emailed Nick Raymond, the engineer in charge of South Lakeland's highways, twice but he has been unable to give me firm news to pass on to you. CCC had hoped to decide last Thursday which of three options to go for but were unable to do so. The options are a temporary bridge downstream, similarly upstream and, thirdly, to repair the bridge like they are trying to do at Victoria Bridge in Kendal. This involves putting large plastic sacks under the undermined foundations and pumping concrete in. It has to be done carefully as concrete is toxic to rivers. I learned yesterday that divers were again seen at the bridge so it is possible that they are trying to assess the extent of the undermining. Nick has assured me that he will let me know as soon as a decision has been made so that I can pass it on to you. I am guessing that if they decide on the repair option they will have to wait for the river to go down. He also said that they have work to do on 90 bridges and, because of the most recent floods last week, they are going to have to re-inspect over 630 bridges. The government Minister of Transport, Patrick McLoughlin, visited St Sunday's Bridge today with various council officials and highways engineers. They met members of Old Hutton & Holmescales Parish Council and two farmers. Photographs of the visit are here. I have heard this morning that CCC is working to put a temporary bridge in place next to St Sunday's Bridge within two weeks. For your information, here is the latest information about the closure of St Sunday's Bridge. The official closure notice indicates that it will probably be closed for at least another month. Thanks for our meeting on Monday and for giving me some more information about the two bridges in my District Ward, St Sunday’s and Hallbeck. Ref St Sunday’s, I understand that having assessed the bridge you have concluded that repairs are necessary in order to make the bridge safe for continued use. Can I emphasise to you the necessity of moving quickly on this and the amount of disruption it is currently causing to the Old Hutton Community? 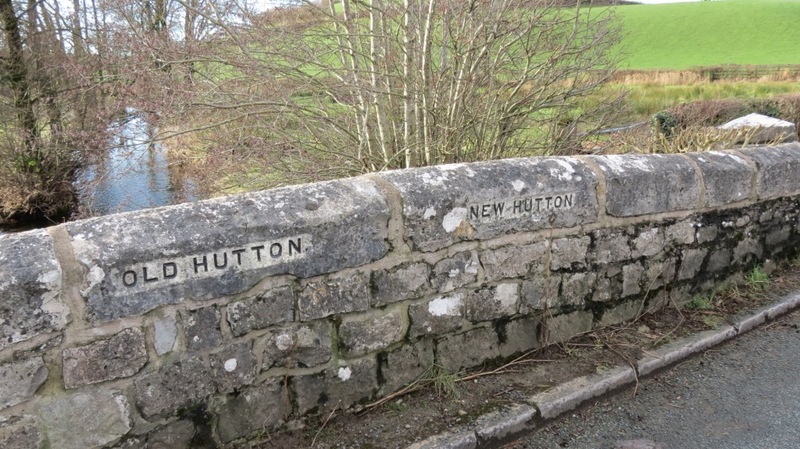 I would also note that the Old Hutton residents have respected the closure and, unlike some areas, have not moved the barriers or used the bridge. I think that this respect deserves the response of moving this bridge to the top of the list. Can I ask that you consider whether it might be possible to reopen it to light traffic? It would be possible to use concrete barriers to enforce this by constructing a short slalom to exclude heavier traffic. Can I also ask that you continue your conversation with TK Robinson who, I believe, have offered a temporary solution? I do realise that you have a lot of bridges to look at and to repair, however I think it worth noting that Old Hutton has put up with a huge amount of traffic serving national infrastructure work. The large amount of work at the sub station, the windfarm, pipeline, quarry traffic etc etc. I have been hugely impressed by their patience over the years and I think it now time that this was repaid. The current view is that St Sundays bridge can’t be opened to light traffic. The position regarding the diversion route is acknowledged and will help determine its priority. The positive attitude of the community in living with this closure is a credit to them and isn’t being ignored. CCC brought in a diver to inspect the submerged foundations of the bridge yesterday. The water is deep and the walls of the bridge's arch have been undermined by the flood. Car and lorry drivers have been moving the barriers and continuing to cross the bridge, as a result of which the bridge is now dangerously unstable, with mortar falling off, stones displaced and some large stones cracked across. There are now large silage bales blocking the road, and hopefully these cannot be moved. Please note that St Sunday's Bridge on the B6254 (at the Bleaze Hall lane/New Hutton Lane junction) has been closed as it is structurally unstable. It has been damaged on various occasions over the last few years and it has been reported to the Council several times that the foundations have been undermined. The recent flooding has now rendered the bridge unsafe. Please do not try to remove the barriers, which are there for your own safety. Follow the diversions! CCC engineers have inspected the bridge at Beckside (the minor road between St John's Church and the Holmescales road) and have closed it. There are now barriers across it.